To steal the hearts of smartphone lovers and create history in sales, Chines smartphone giant, Xiaomi planning to launch world’s cheapest 4G LTE smartphone, Xiaomi Redmi 2 with quad-core and 8-MP camera. If rumours turn into reality Redmi 2 will launch before Christmas priced at CNY 399 in China ( Approx Rs 4,000/$65). Xiaomi Redmi 2 looks like latest Redmi Note smartphone but identical to Xiaomi Redmi 1S but more stylish , lighter and affordable. It will truly an unbeatable smartphone. According to latest leaks, Xiaomi Redmi 2 is world’s cheapest 4G LTE smartphone supports Dual-SIM(GSM+WCDMA) G LTE, 3G, GSM/ EDGE, WCDMA, LTE FDD, and TD-LTE comes with a bigger 4.7”-inch Full HD display with AGC Dragontrail™ scratch-resistant glass. 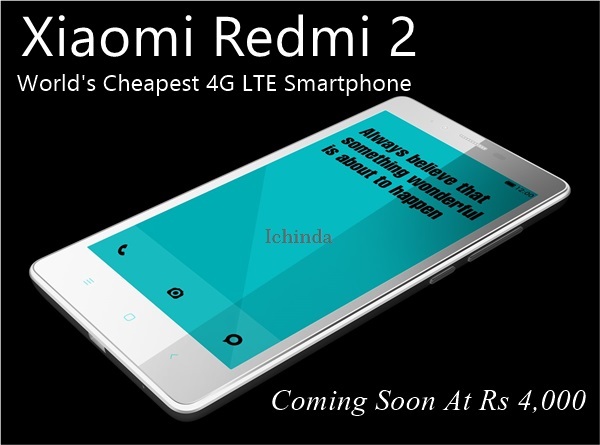 Redmi 2S will run on Android 4.4 kitkat OS and 1.2GHz Quad-core procesor with Mali T628 GPU processor with 1GB RAM, 8GB internal memory expandable up to 64GB via MicroSd card will sport dual camera, a 8-MP rear camera with ƒ/2.2 aperture, 28mm wide angle lens and up to 720p at 120fps and 1080p at 60fps, With an extra large 1.4ųm sensor and a 5 plastic lens, you can take photos with accurate, true-to-life colors in low light while 2- megapixel camera is perfect for HD video chatting at 720p expected to be powered by with a powerful 2900mAh battery measures measures 134×67.21×9.2mm and weight 132gm including Mi Sound Hi-Fi System with Dirac sound tech. Xiaomi has recently launched Xiaomi Redmi Note in Indian market on 24th Nov. 2014 priced at Rs. 8,999 which supports Dual- SIM with Dual-Mode(GSM+CDMA) offers connectivity through 4G LTE, 3G, NFC, Wi-Fi, Bluetooth, USB and GPS comes with a bigger 5.5-inch full-HD LCD display with resolution (720×1280 pixels) and a pixel density of 441ppi and With Glass-film-film (GFF) architecture delivers stunning color consistency runs on tweaked version of the Android 4.4 kitkat dubbed MIUI version 6 which is more useful, more secure, and more fun with Uncompromised depth and the powered by 1.7GHz octa-core MediaTek MTK6592 SoC Processor makes multitasking a breeze and you explore immersive game environments while 2GB RAM, 8GB internal memory and 32GB expandable memory. Redmi Note also combines 13-MP Primary rear camera with dual-LED flash, Sony’s stacked CMOS sensors(f/2.2 aperture) lets you capture more with each shot. More scenery, more friends, more of the moments while 5-MP front facing camera is perfect for video calling. It also packed with a powerful 3100mAh Li-ion battery with power management technologies promising Stand by time up to 775 hours and Talk Time up to 38 hours measure 154mm x 78.7mm x 9.45mm weight 199gm including Ambient noise reduction mic and Redmi Note Case in five colors.